BIOTEK® manufactures and sells a full line of quality medical storage cases with more sizes, colors and options than anyone. We have cases specifically designed for storing standard BLS supplies as well as an entire line of specialized cases for ALS airway, drug and pediatric needs. 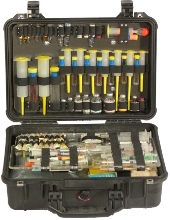 Biotek® designs every case so that the items of greatest importance are visible and easy to get to. All such equipment is individually and securely held in place with elastic strapping or Velcro closures. Many cases have see-through two-sided Acrylite center inserts that utilize space for equipment on both sides, or Acrylite cabinetry in the bottom. This design provides better organization than the shelves of tackle boxes or the zippers and pouches of soft packs with unlimited versatility and virtual indestructibility. Re-stocking after a run is much easier, safer and faster because each item has a unique storage space built in. This is an added benefit for billing and inventory control. Clean up is safe, quick and simple. These concepts can only be found in a Biotek® case. See our lineup of cases. Providing high quality trauma cases for 35 years.